Preheat oven to 350 degree F. Coat an oval baking dish with 1 tablespoon oil. Heat 5 tablespoons oil in a large skillet over medium-high heat. Add onion and saute until translucent, about 5 minutes. Add breadcrumbs and thyme and stir until breadcrumbs are lightly toasted, about 3 minutes. Transfer to large bowl. Mix in tomatoes, cheese, eggs, garlic, salt and pepper. 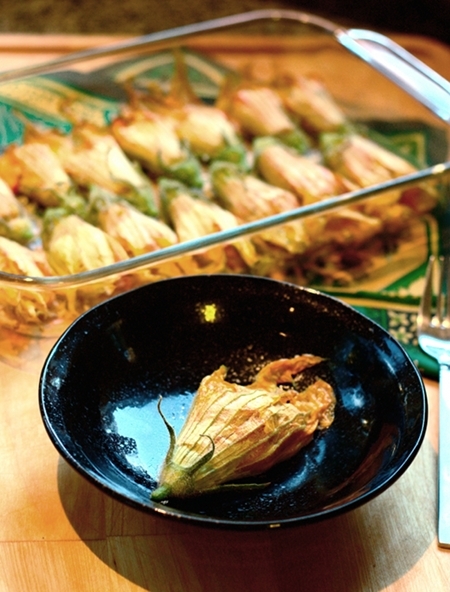 Fill Zucchini blossoms with breadcrumb mixture, using about 2 teaspoons for small blossoms and 1 tablespoon for large blossoms. Sprinkle any remaining breadcrumb mixture over baking dish. 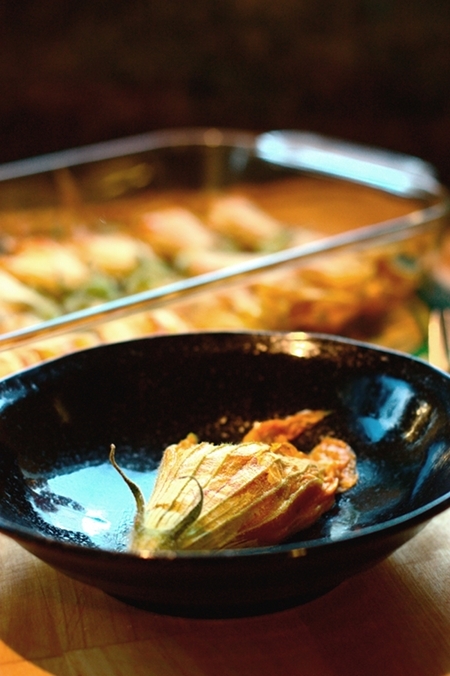 Place blossoms atop breadcrumbs in dish. Drizzle remaining 2 tablespoons oil over. Bake for about 20-30 minutes. Serve with lemon wedges. Recipe is taken from Epicurious website.